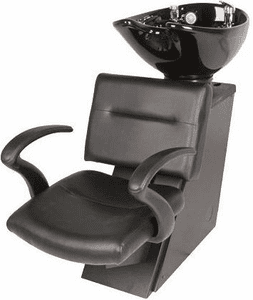 Popular Backwash Shampoo System with Eclipse Chair. Features heavy-gage black powder-coated metal chassis for long-life, oversized black porcelain shampoo bowl that tilts, and seat-slide adjusts chair front-to-back. Black bowl with 570 fixture, spray hose, tilt-mechanism, strainer, drain, and flexible tail stock. The optional 388-ASC Vacuum Breaker is also easily added. Copyright 2019 PaynesBeautySupply.com. All rights reserved.